An (any) Arduino even without any of the other hardware will run the KIM Uno. You can then only use the serial terminal mode. The PCB adds a physical keyboard and LED display. Careful: If you use the PCB design, check you have a Pro Mini with the same footprint for A4 and A5 pins. There are other variants. 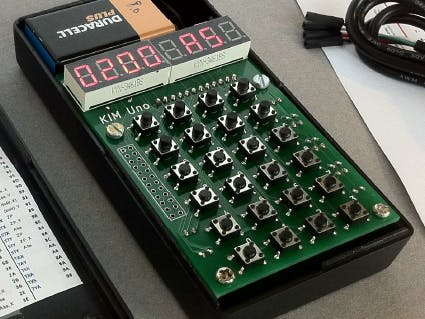 The KIM Uno is an open source hardware project to replicate the classic 1976 KIM-1 computer. It doubles up as a 6502 programmable calculator, plays chess, and is a pretty good machine language learning tool including the amazing 550-byte disassembler Woz wrote in 1976. Costs are about $12 in commonly available parts. This can either be a software-only project on any Arduino, or be made into a stand-alone device using the custom PCB. Or just convert a dead calculator! 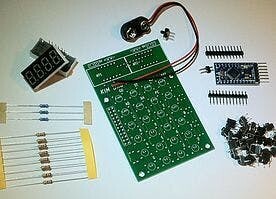 It is a very simple project to build: 11 resistors, 24 buttons, LED display & Arduino Pro Mini. Send the Gerber files to a PCB manufacturer, or you can buy the whole thing as a kit (hobby, not for profit) from me here. This was designed with education in mind: as a first soldering project, after which it teaches something about how CPUs really work. See the web site for details and manual. Historical interest. 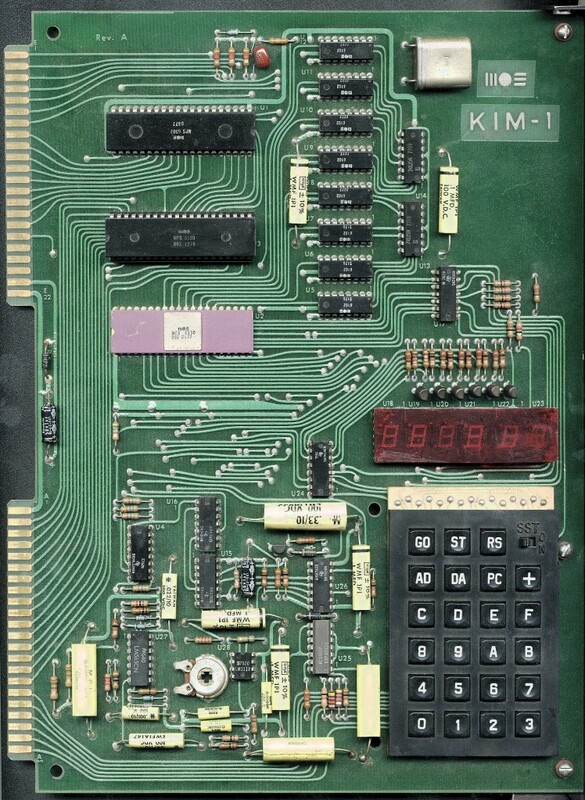 The KIM-1 was hugely important in early microcomputer development. Educational value. Programming a KIM-1 is a great way to understand the deep inner guts of any computer. Hacking fun. The KIM-1 core is simple, and many things can be done with it. Improve the 6502 with extra instructions, or hook up peripherals through I2C. My real KIM-1 no longer works. 1976... Microprocessors have existed for less than 24 months. Less than 12 months ago, the Altair 8800 became the first commonly available microcomputer, using an Intel 8080. It costs over $600, a big box containing 256 bytes of RAM and no ROM. You toggle in your program bytes bit-by-bit. Alas, you can't save your program, unless you buy add-on boards that are just appearing on the market. Enter the new KIM-I, intended as just a demonstration board by MOS Technology to showcase their brand-new 6502 microprocessor. One year after the Altair, the KIM-1 sports 1152 bytes of RAM, plus 2K of ROM with a monitor program that is much easier than the Altair's front panel. And it has a serial port to connect a printer or terminal. And it has a cassette interface so you can save your programs. All that on a small board for $245. Commodore bought MOS Technology the same year, and built upon the KIM-1's momentum by introducing the PET and later the VIC-20 and C-64. Apple too built its empire on the 6502, as did Atari and Nintendo. In case you have a 3D printer. A ready-made case is also available. Tested on Arduino Pro Mini, Arduino Uno, Nano, Mega etc.